Marhaba (that’s “hello” in Arabic) to everyone! I can’t believe my month-long absence from this space. Thanks for the continuous visits and I gathered that most of you thought that I’m still in the Philippines for a vacation. I’m back in Abu Dhabi 3 weeks ago, yet I’ve been (and still) swamped with work. My responsibilities are getting crazy and amazing at the same time, but I’m not complaining! When time gets tough(er), I always refer to that scenario when a man complained about his feet sores until he saw a man who’s handicapped. And of course, it’s best to think of the better days. Anyway, here’s to catch up with the things that happened not so long ago. Before I share the Philippine-related entries (i.e. highlights of my recent break), this one’s to reminisce the less than 24 hours we had in Singapore enroute to Abu Dhabi. Thank you for your comments and response as I trimmed by anonymity last time to a certain extent. Here’s another article from me as a guest blogger in Singapore’s community page, a project by Ministry of Information, Culture and Arts (MICA) of Singapore. Apparently, it has been published on the colorful day of Valentine’s Day. While I did not write about the V Day, I spoke about some of the vibrant attractions in the Lion City. Click the links to read (and leave a comment) about Colour Me Happy, Singapore and How to map a culturally enriching Chinatown experience? I was invited to be a guest blogger for Singapore’s blogger community webpage, one of the recent projects of the Ministry of Information, Culture and Arts (MICA). While I am not a Singaporean nor a resident of this charming country, my previous entries spoke how much I liked doing the tourist-y and non-tourist-y stuff there. I do join five other bloggers who would share about working in Singapore (Peter Breitkreutz of AussiePete), events (Kenny Sia), food (Leslie Tay of I eat I shoot I post), expat living (Neil Humphreys), and arts and heritage (Nicole Frank). When I was about to draft my first article, the corners of its Chinatown zoomed on me and I guess that just goes to show that it is one of my most memorable spots there. Later on, I realized that it is just in time to write about it for the Chinese New Year. As you visit the blogger community webpage, you will notice the red and green (empty) thumbnails along the existing guest bloggers. Apparently, an exciting contest is up for all Singaporeans and non-Singaporean permanent residents. 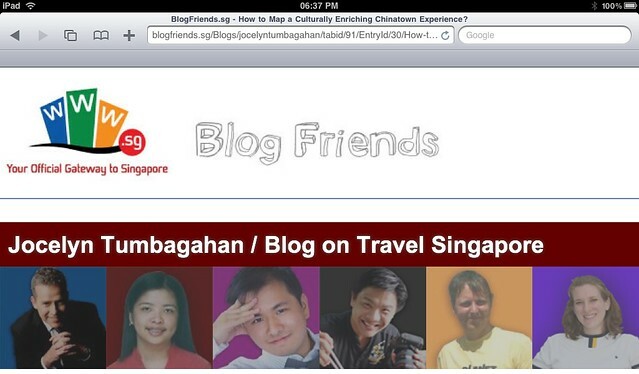 At stake are all expenses paid stay in Singapore, iPads, and a chance to be our co-blogger in www.BlogFriends.sg. More contest details here. 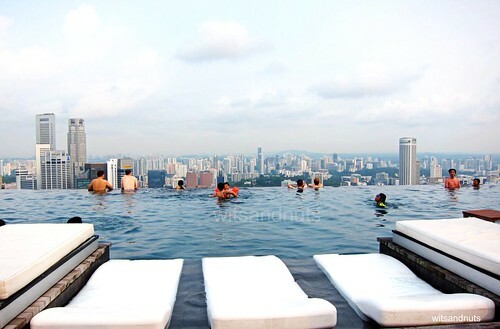 Related post: Colour Me Happy, Singapore!